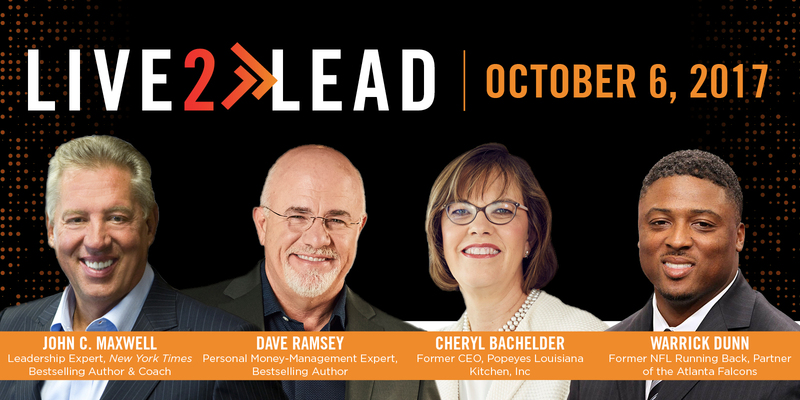 Live2Lead, a half-day leadership and personal growth event, originating LIVE in Atlanta, GA, on October 6, 2017. This event is an annual leadership simulcast developed by The John Maxwell Company, who for decades has shared Biblical leadership and personal growth principles, impacting thousands of companies and ministries around the world. Live2Lead will be hosted and simulcast locally on Friday morning, October 6, 2017, from 8:45am-12:30pm in the Dayton area by John Maxwell Coach Cristy Kettering at Far Hills Community Church on Clyo Road in Centerville. Bring yourself and your team for a morning of clarity, growth, and strategy. Attendees will learn from renowned leadership experts from a variety of industries, gain a new perspective on relevant topics, and get practical tools to take home with them. We guarantee you will leave equipped and excited to lead and create change with renewed passion and drive. This year’s speakers Dr. John C. Maxwell, Dave Ramsey, Cheryl Bachelder, and Warrick Dunn. Title Sponsor for 2017 is McAfee Heating and Air. HomeSown.org and Tuttle Rehab are also sponsoring, and Strong Tower Christian Media is the media partner. Use the Promo Code: ChristianBlueNetwork for 50% off of a General Admission Ticket.